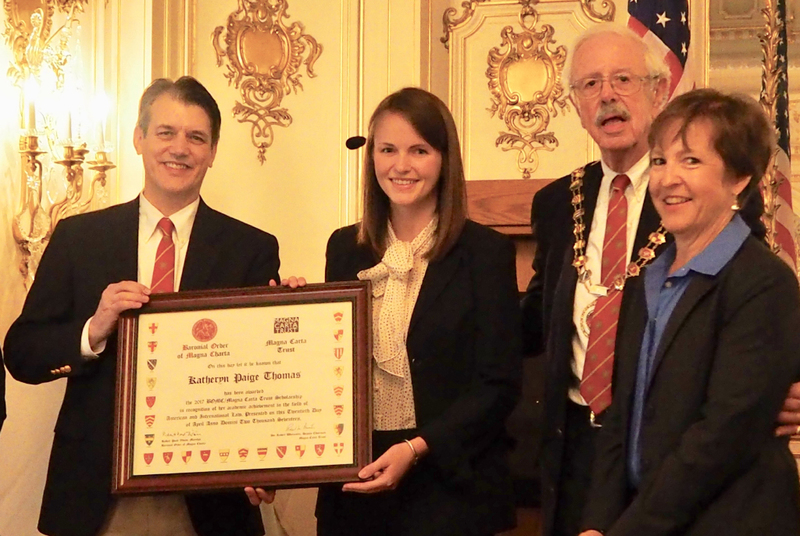 The Baronial Order of Magna Charta (BOMC) is creating a special scholarship program at a renowned American Law School for a student of high merit who has studied the principles of Magna Carta as recognized in the United States Constitution, the Declaration of Independence and the Bill of Rights, and who has demonstrated an interest in international law and human civil rights. The recipient is also expected to be a leader in future efforts to emphasize the importance of Magna Carta. 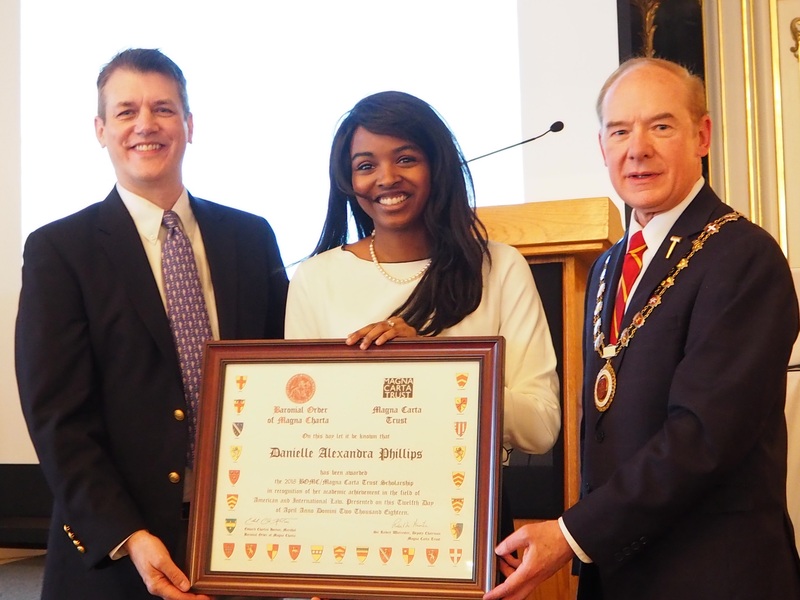 The scholarship will be awarded jointly in the name of the Magna Carta Trust and The Baronial Order of Magna Charta, and the first student selected will attend the BOMC First United States Triennial Magna Carta Symposium. Upon receiving the award, the winner will offer remarks. 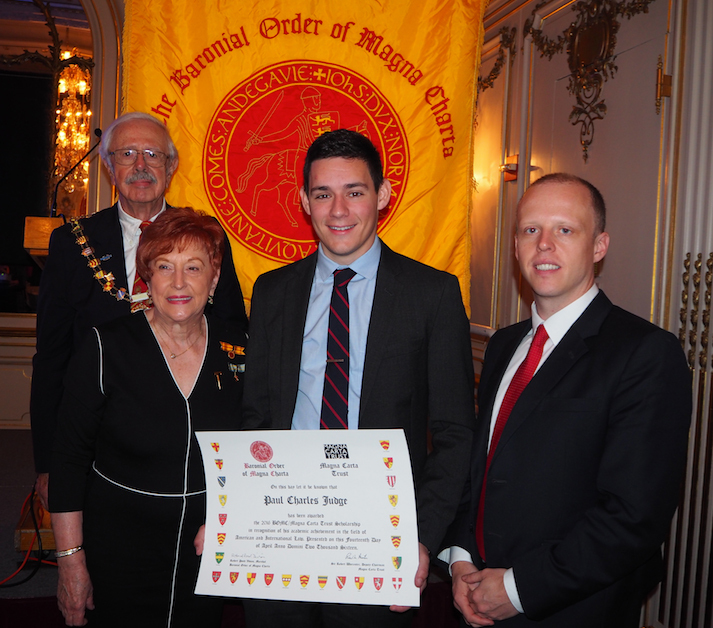 Mark Gill (right) Executive Director Magna Carta 800, presented the Second Annual Baronial Order of Magna Charta — Magna Carta Trust American Law School Scholarship on 14 April 2016 to Paul Charles James, a student at the Washington and Lee University School of Law. Dianne Alley Robinson, Chairman, BOMC-MCT Scholarship Committee, and Marshal Robert Pond Vivian joined him at The Cosmos Club in Washington, DC. Sir Robert Worcester, Chairman of the MC 800th Committee announced 17 June 2014 at Runnymede, an award of 16,000 Pounds Sterling from the MC Trust to The Baronial Order of Magna Charta. The award will help support an American Law School MC Scholarship Program to be awarded in the name of the MC Trust, and BOMC. and support a U. S. BOMC Triennial Magna Carta Symposium. The big news of the past month is the Chancellor George Osborne’s announcement of a grant of £1,000,000 to the work of the 800th Anniversary Committee. This will provide core funding to support anniversary activities across the world, including to help the Committee increase our social media impact over the next 18 months. The bulk of the funding will go towards grants to support the activities of organization affiliated to the Trust and the 800th Committee, as well as other associated organization, for events and activities to be delivered in 2014/15. Each grant will be of no more than £20,000 inclusive of VAT. • Promote the objectives of the Trust and of the 800th Committee. • Give emphasis on legacy and education, over one-time events or “celebrations”. • Support activities in Commonwealth countries, as HM the Queen, the Trust’s Patron, requested when she became Patron. We are tremendously pleased at this outcome. This grant is a true game-changer for the 800th Committee, for our partner organization, and for the commemoration of Magna Carta globally. We are grateful to the Chancellor and HM Government for their support.